Desert Rose can be grown anywere if cared for properly with warmth and sunling. With the swollen stems and beautiful pin and white flowers clustered tightly with narrow green leaves, these plant are very distinguishable. The desert rose need plenty of waterm but can't survive in standing water. So make sure you choose pot with superb drainage to prevent standing water. Ceramic pits are best. Making sure The desert rose is planterd in a container that can be easily moved when the weather demands and has great drainage will allow yout to have a succulent plant year round. The desert rose is perfect for a sunny window because it needs full sunlight daily. And because as natural habitat is in the rainforest o africa and arabia so it is important that the temperature is kept at minimum of 50 degres at all times. At 60 degres of higher it may retain its leaves all winter. The soil nees to allow for optimal drainage and an ideal pH of 6.0. During the winter months placing your pot into a shallow tray of pebbles with water added is a great way to help the plant retain moisture. Watering Desert Rose 2-3 times a week during spring and summer. And 1 time a week during fall and winter. Don't afraid to leave the plant while you go on vacation. It can live several weeks without water. If you use a proper soil and pot, you'll not have a problem. Change place in different seasons. In spring, summer and falf, as long as the nightly temperatures don't drow below 40 degers, the bonsai can be left out on the patio or in the garden. Bun during the winter when the temperatures begin to near 40 degres, it is time to bring the bonsai inside. Place the plant in a window that is facing the sout so that it can receive as much sunlight as possible. It is normal for the Desert Rose to lose some of its foliage, if not all during the winter months. In the spring you want to use a soluble fertilizer every two weeks. The early summer, whet the plant's growth rate slows, stop using the soluble fertilizer and make one apllication of a slow-release plam sepcialize fertilizer. In early fall, abotu tow monts later, aplly the slow-release palm sepcialized fertilizer one more. Trimming and pruning your desert rose in the spring will help it grow more banches and more foliage for a fuller more lush plant. When trimming and pruning you want to cut back the new growth as far as you can wihtout cutting off too much. The plant needs some new growth to help it remain healthy. How much you trim back depends on how small you want your desert rose to remain. 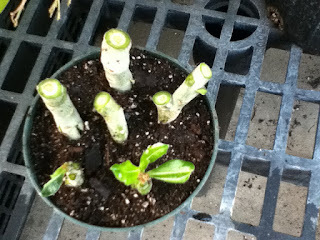 Mid spring is the best time ro repot your desert rose. Make sure you knock the dirty of ther roots and remove any dead or rotted roots and reat any cuts it may have wiht a fungiside. when you put it new pot, fill with dirt as you go along so that you can spread the roots and give the room to grow. Ater the repot, wait a week or two before you give it water. If you want propagate desert Rose from a seed so you must make sure your seed is fresh and place it in a container filled wiht a well-draining frowing medium such as perlite or a sand and soil mix and just cover. While keeping your seed between 80ºF and 85ºF you need to water them from below daily and from above once every three days. Once the seedling appears only water it from below until it is large enough to transplant. You will see the seedling bloom in the same year. And fil you want to propagation from cutting, after you have let the cutting from the tip of a branch dry otu for a day or two, water the end of the cutting. Then dip the end into a rooting hormone and plant it in a well-draining growing medium. Water and spray with a mist daily. In about 2-6 week it will tek a root. When the big enough, transplant into a more permanet container.